Yes, you read that right. Corn, as in corn on the cob, ice cream. And no, I’m not a total nutbar (well, maybe). Although, I must admit, I’m not sure I’d make this again. It was over-the-top rich and creamy. As in creamed corn, which I’m not crazy about. It looked gorgeous though, don’t you agree? A lot like my beet ice cream. Pretty on the outside, peculiar on the inside. * Remove and discard the husks. Boil the ears for about 10 minutes, remove from water and let cool. Remove the kernels and set aside in a small bowl. Save the corn cobs for later. Combine the milk and cream in a medium saucepan. Break the de-corned corn cobs (I don’t know what to call them) in two and carefully drop them into the cream mixture. Bring ingredients to a slow boil, reduce heat and simmer lightly for 30 minutes. Stir occasionally. Once the 30 minutes is up, remove pan from heat and remove corn cobs. Combine the eggs, egg yolks and maple syrup in a medium bowl and beat on low-medium speed for about 1-1/2 to 2 minutes. Scoop out 1 cup of the hot liquid from the milk/cream mixture. With mixer on low speed, add the cup of hot liquid to the egg mixture in a slow steady stream. When thoroughly combined, pour the egg mixture back into the saucepan and stir to combine. Cook, stirring constantly, over medium low heat until the mixture is thick enough to coat the back of a spoon. Transfer to a bowl, cover with a piece of plastic wrap placed directly on the custard, and chill completely. Turn on ice cream maker, pour the chilled custard into the freezer bowl per manufacturer’s directions and let mix for 25 minutes until thickened. Add kernels and mix another 5 minutes. Eat or freeze for later. I’m thinking a drizzle of caramel sauce might be nice on this – caramel corn ice cream. Literally. Go forth and try new things (but maybe not this)! P.S. I can’t decide if this is oddly wonderful or just plain weird and slightly unpleasant. I keep tasting it though. Hmmm? This frittata was made from ingredients I picked up last night from my Grant Farms delivery. I decided I wanted to make an Italian egg dish for dinner tonight and gave myself some rules. I could only use what was in my CSA box. No additions, no substitutions. 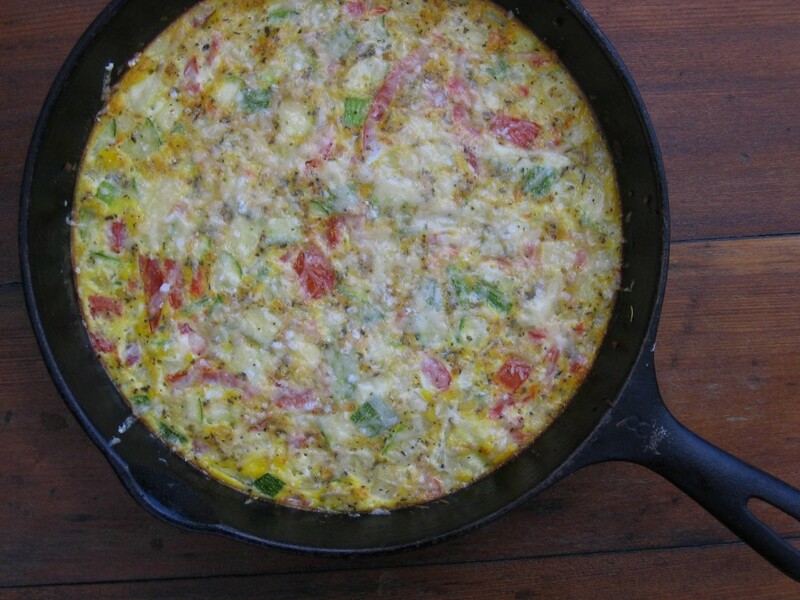 When I picked up my load of veggies, fruit and farm-fresh eggs, my imagination veered towards a frittata-ta-ta dinner. The name “across the farm” came from a bright and engaging woman whom I know from commenting on one of my favorite British food blogs. Anne called a vegetable soup an across the garden soup because it simply had whatever ingredients were available from the garden at that time. I LOVE that. So, I’m borrowing the name, tweaking it, and giving Anne full credit. Other than a pat of butter, two cloves of garlic and a sprinkling of cheese, everything in this recipe appeared in my pick-up box last night. Thank you, Andy and gang. YUM! Heat oven to 375 degrees. In a heavy skillet (I use my grandmother’s old cast iron skillet), heat the butter or oil. Make sure you coat the bottom and sides of the pan. Sauté the onions for about 5 minutes, add the garlic, stir and cook another 2 or 3 minutes. Add the squash and continue cooking for about 5 more minutes. Now add the tomato, corn, herbs and seasonings; sauté and stir another few minutes until all ingredients are well mixed. Pour eggs over top, place on center rack in oven and cook for 15 minutes. Remove from oven, sprinkle with a small amount of Parmesan cheese and return for another 5 minutes. Serve with a plain mixed green salad and a glass of nice pinot noir. Yes, you can serve wine with eggs, just not at breakfast. Go forth and enjoy across the farm goodness! Holy kohlrabi, what am I going to do with all this stuff? I’m being bombarded with vegetables and fruit. This was last night’s small share delivery. SMALL share, but in a Brobdingnagian way. And some of the veggies and the pears didn’t even make it into the photo frame. Oh, and I totally forgot to add my dozen farm-fresh eggs. Okay, I’m warning the rest of you. This week’s harvest is pretty darn overwhelming. But I’m here to help you with some tips on how to wash, spin, store, eat, eat, give away, freeze, eat, eat, and eat some more farm fresh food. And don’t panic, you can’t gain weight eating veggies. Unless you pair them with donuts and soda pop. I could eat that whole table of food in two days by myself and not gain an ounce. 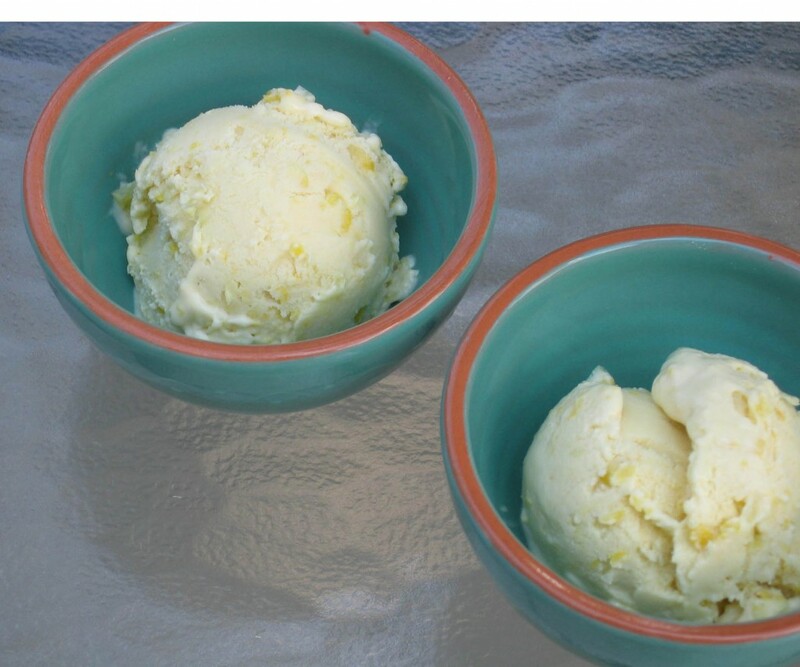 Having said that, I’m making sweet corn ice cream today. So there are no guarantees if you mess with the originals. For washing, spinning and storing lettuce, check this post of mine. 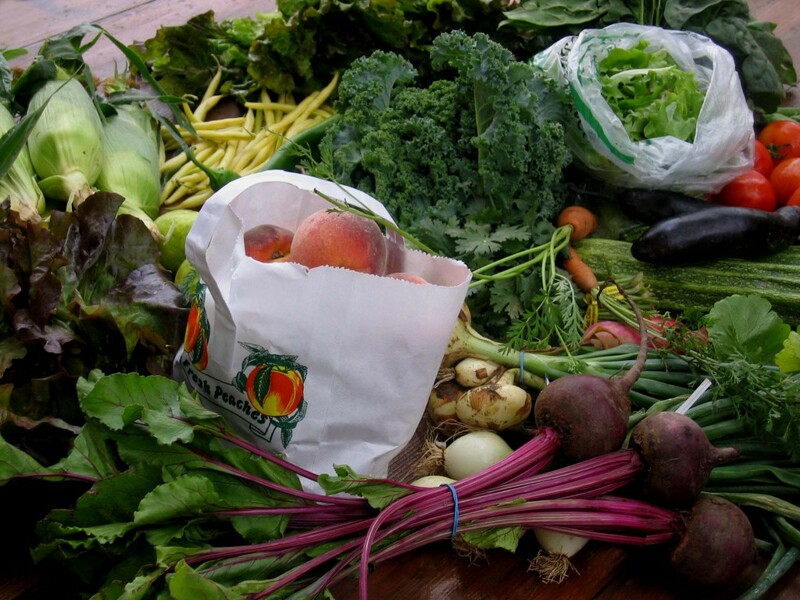 For tips from the experts on storing veggies to retain their flavor and aroma, check here. For a great SeriousEats post on how to unclutter your fridge and store veggies, check here. This was my breakfast this morning. 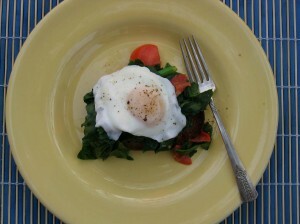 Spinach, tomatoes and a poached egg on toasted Montina bread (made from Indian rice grass). Sauté 2 cups of chopped spinach and 1 diced tomato in a small amount of olive oil over medium heat for 3 to 5 minutes. Poach an egg while sautéing spinach and tomatoes. Pile onto toasted bread, no butter needed. Season with sea salt and freshly ground pepper. This can also serve for lunch or dinner. Heat olive oil in a large skillet on medium heat. Add chopped onion and cook until lightly browned. Remove onion from pan and set aside for now. Add greens and a few tablespoons of broth to the skillet and stir gently. Turn the heat down, cover and steam until tender (anywhere from 3 to 8 minutes depending on how like your greens cooked). Remove greens to a colander to drain. Put onions back in the skillet; you may need to add a small amount of olive oil (if using, add garlic at this time), heat to a sizzle, cook garlic for 1 minute and add tomato paste. Stir until onions, garlic and tomato paste are well mixed and warm. Return greens to the pan; mix, heat and serve. 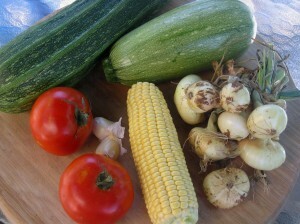 Stay tuned for sweet corn ice cream and how to freeze and use all those tomatoes! Go forth and eat your veggies before they eat you! 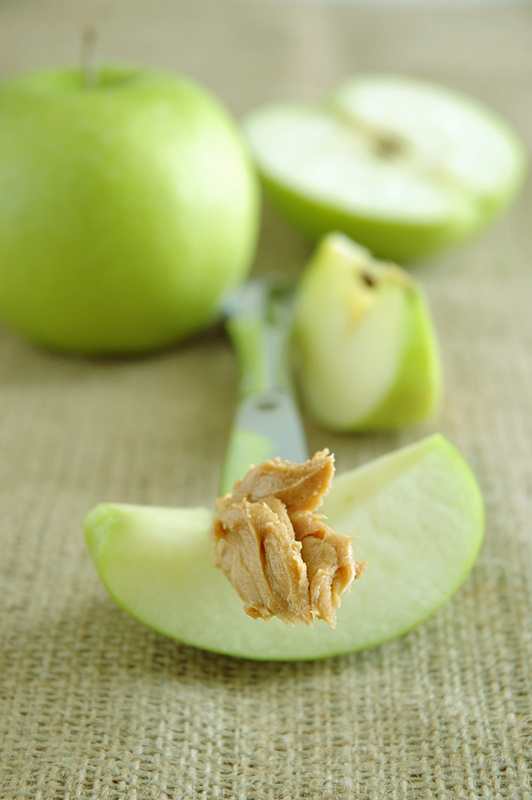 I eat an apple with almond butter almost every day. It’s my pre-yoga breakfast. Every so often I switch it up with fresh ground peanut butter, although not often. I create nut butters by grinding whole nuts, so I’m not too concerned about food safety. But as a “food” person, I thought I’d throw out some information on the current recall of peanut butter from the Peanut Corp of America (PCA) due to a salmonella outbreak. The FDA has confirmed that the outbreak resulted from products originating at the PCA plant in Georgia. At this point, 486 people from 43 states have become ill. It’s serious — with over 100 hospitalizations and 6 deaths. We have 12 reported cases here in Colorado. Ohio has the most at 65. For a state by state list, consumer recommendations, and information about salmonella, check this site at the Center for Disease Control. PCA doesn’t sell peanut butter directly to the consumer, so jars of major national brands aren’t affected. 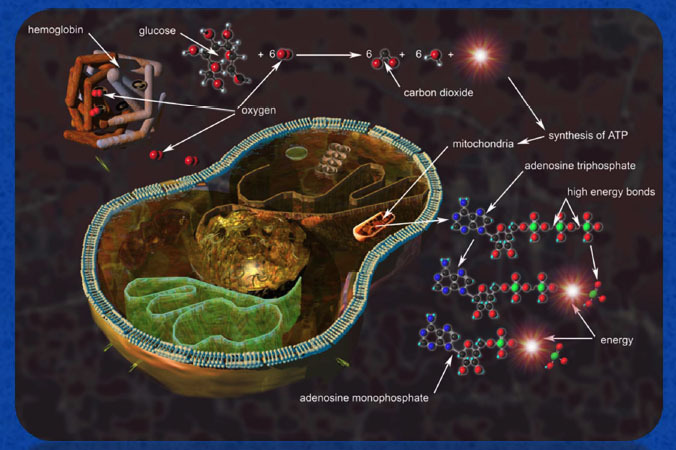 It’s the processed foods you need to worry about. Some manufactures use peanut butter or peanut paste to make cookies, crackers, bars, cakes, etc. Keep in mind that peanut butter is also used in making dog treats, so it’s not only people food we need to be concerned about with the recall, but dog food as well. While there are lots of what I’d call junk foods on the recall list, two good ones jumped out at me — Clif and Luna Bars. I occasionally eat Clif Organic Nectar Bars, which don’t come in peanut butter flavor, but you might want to check this list if you buy Clif products. For a current (as of today) list of all recalled products, check here. The list is long and some foods have been exported to other countries, so if you eat peanut butter treats, make sure they aren’t part of the recall. It’s not always easy to do, but eating local food and knowing where your food comes from helps diminish food safety issues.